Your body is a mysterious and complex thing. The number of physical processes that go into something as simple lifting a cup to your mouth is actually pretty amazing. That being said, with so many parts working together, sometimes things go wrong. And sometimes, something that you have never even heard of before is to blame. Take hyperphosphatemia, for example. What is hyperphosphatemia? Well, it can occur when you have elevated phosphate levels in your blood. It sounds pretty severe, doesn’t it? What does it actually mean for your health? We will examine the signs and symptoms of hyperphosphatemia, as well as identify the common hyperphosphatemia causes and how it affects phosphate homeostasis in your body. Hyperphosphatemia results from abnormally high levels of phosphates in your body. So what’s the big deal? What’s the function of phosphates in the body? The role of phosphates in the human body is probably a little larger than most people realize. Phosphates are electrolytes that are essential to the formation and strengthening of teeth and bone. About 85% of the phosphates in our body are found in our bones. The other 15% is found in various cells and blood. The number of phosphates found in the bloodstream is limited, but it is also the blood that helps transfer phosphates in and out of the bones. It’s a delicate balance, and if it is thrown off, excessive phosphates can cause issues within the body—or at the very least, they are a warning sign that something is wrong. The effects of this imbalance are not exactly pleasant. Over the short term, it can cause things like subcutaneous tissues, the deposition of calcium and phosphate in bone joints, and chronic kidney disease. Long-term effects can include renal failure; bone, skin and heart complications; organ damage, and damage to the vascular system. As you can see, the consequences of hyperphosphatemia can be pretty devastating if left unchecked. Hyperphosphatemia could be a bad thing to happen to you. Understood. What are the symptoms we can use to recognize it? Well, here is the part that gets tricky. For the most part, hyperphosphatemia symptoms aren’t there. Your eyes don’t bulge, and you don’t get a rash. If hyperphosphatemia does not have any direct symptoms, how do you catch it? 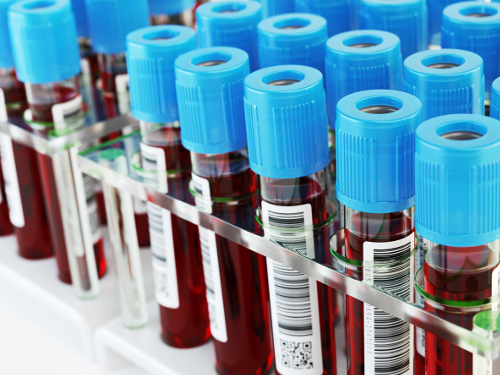 Hyperphosphatemia is usually found through blood work and tests. However, these are typically performed after the cause behind the rise in phosphate levels is discovered. In terms of the basic causes, there is also basic treatment. If your intake of phosphates through food and drink is too large, you can change your diet to decrease the phosphates in it. To increase the excretion of phosphate in the body’s system, a forced saline diuresis may be used at a doctor’s discretion. Exercise can also help prevent phosphate buildup, as well as help you rid your body of the excess. Even a light walk once a day can help you feel better. There are also a few medications that may be prescribed, like aluminum hydroxide or calcium carbonate tablets. Aluminum hydroxide is used sparingly due to fears of poisoning. The most common of these issues tends to be kidney disease as your kidneys are involved in your body’s processing and removal of excess phosphates. Unfortunately, hyperphosphatemia is one of the leading contributors to death in patients with a history of kidney issues, failure or transplants. There’s a chance that you may be a little worried about hyperphosphatemia. It often doesn’t have symptoms, and left untreated, it can cause a fair amount of damage, maybe even death. But that doesn’t have to be the case. If it is discovered on its own, there are a number of treatment options. If it is found while treating another medical issue, the doctors can help you find a way to treat the conditions concurrently. It’s important to remember not to give up and to listen to your doctor’s advice, especially if you have a history of kidney issues. Lederer, E., “Hyperphosphatemia,” Medscape, November 17, 2016; http://emedicine.medscape.com/article/241185-overview, last accessed July 7, 2017. Kerkar, P., “Hyperphosphatemia: Causes, Symptoms, Treatment, Prognosis, Pathophysiology, Prevention,” ePain Assist, April 18, 2017; https://www.epainassist.com/blood-diseases/hyperphosphatemia, last accessed July 7, 2017. Dr. Chris, “Hyperphosphatemia (High Blood Phosphates),” Health Hype; http://www.healthhype.com/hyperphosphatemia-high-blood-phosphates.html, last accessed July 7, 2017. Lewis III, J., “Overview of Phosphate’s Role in the Body,” Merck Manual; http://www.merckmanuals.com/home/hormonal-and-metabolic-disorders/electrolyte-balance/overview-of-phosphate-s-role-in-the-body, last accessed July 7, 2017. Lewis III, J., “Hyperphosphatemia (High Level of Phosphate in the Blood),” MSD Manual; http://www.msdmanuals.com/home/hormonal-and-metabolic-disorders/electrolyte-balance/hyperphosphatemia-high-level-of-phosphate-in-the-blood, last accessed July 7, 2017. “Hyperphosphatemia (High Phosphate),” Chemocare; http://chemocare.com/chemotherapy/side-effects/hyperphosphatemia-high-phosphate.aspx, last accessed July 7, 2017.